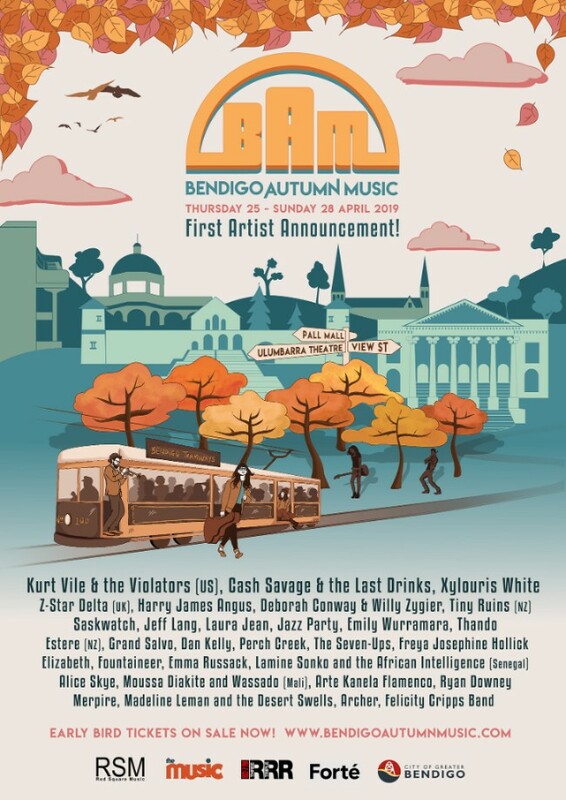 Today we announce the absolutely huge first line-up for the inaugural Bendigo Autumn Music (BAM) festival, set to take place in venues in and around Bendigo’s arts precinct in April 2019. Following in the tradition of Red Square Music’s sell out boutique music festivals, in Mullumbimby and Bellingen, BAM delivers a diverse line-up that spans many genres and includes a generous offering of 30 local and international acts with a little something for everyone. Headlining the four-day festival is Kurt Vile and the Violators. The Philadelphian born singer-songwriter is heading to Australia in support of his smokin’ new album, Bottle It In, the almighty follow up to last year’s collaboration with Courtney Barnett. As part of BAM, Kurt and band will perform at Bendigo’s most revered venue, The Ulumbarra Theatre, on Friday 26 April. ‘Ulumbarra’, meaning ‘gather together’ in the language of the local Dja Dja Wurrung people, is now a 1,000-seat state-of-the-art theatre in the heart of the festival precinct. Once home to Chopper Reed, the refurbished 1860’s Sandhurst Gaol will no doubt be a huge drawcard for Kurt Vile fans looking for a unique concert experience out of town. Also on the line up are the world’s finest purveyors of post-punk Cretan folk Xylouris White, the incandescent Cash Savage and the Last Drinks, UK’s desert-blues rock goddess Z-Star Delta, the one and only trumpet-playing vocalist and all-around raconteur from The Cat Empire – Harry James Angus, who will be presenting his gospel production, ‘Struggle with Glory’, ARIA award-winning agitator and power-house Deborah Conway & Willy Zygier, as well as three-time ARIA award-winning guitarist Jeff Lang. In addition heading to Bendigo next April are folk-turned pop singer Laura Jean, psychedelic folk four-piece Tiny Ruins (NZ), sub-tropical boogie poet Dan Kelly, the prolific songwriter and multi-instrumentalist Emily Wurramara, indie-folk singer-songwriter Emma Russack, party favourites Saskwatch, critically acclaimed Melbourne artist Grand Salvo brings his acclaimed new album to the Capital Theatre for an ensemble performance, Zimbabwean born R&B soul diva Thando, rock’n’roll party starters Jazz Party and Totally Mild’s Elizabeth performing her new solo project. And the list continues with Melbourne funk band channeling 1970s Nigerian Afrobeat The Seven-Ups, dream-pop artist Merpire, New Zealand’s electric-blue witch-hop artist Estere, Springsteen influenced indie band from Bendigo, Fountaineer, Americana alt-rockers Madeline Leman and the Desert Swells, Alice Skye, mid-century crooner Ryan Downey, Freya Josephine Hollick, Moussa Diakite and Wassado (Mali), Arte Kanela Flamenco, Perch Creek, Lamine Sonko and the African Intelligence (Senegal), and Castlemaine locals – troubadour storyteller Archer and anthemic folk-pop outfit Felicity Cripps Band. With more news to come shortly, early bird tickets are on sale now for a long weekend away, perfect for immersing yourself in music and arts in the charming city of Bendigo.